Many of the latest generation devices are able to record videos at very high resolution, even pushing up to 4K Ultra HD, even at high frame rates. These include the latest generation of smartphones, which produce 4K video even at 60 fps, or action cameras, which can record up to 240 fps. High resolutions and high frame rates inevitably lead to the creation of files that become heavier and more difficult to manage, and even more difficult is the editing. All the old-fashioned software fails to provide acceptable times in the encoding of the various video montages of holidays or of adventures. The new VideoProc by Digiarty, a historical software house in the field of video editing and encoding, responds to these modern needs. But why prefer VideoProc to other software? 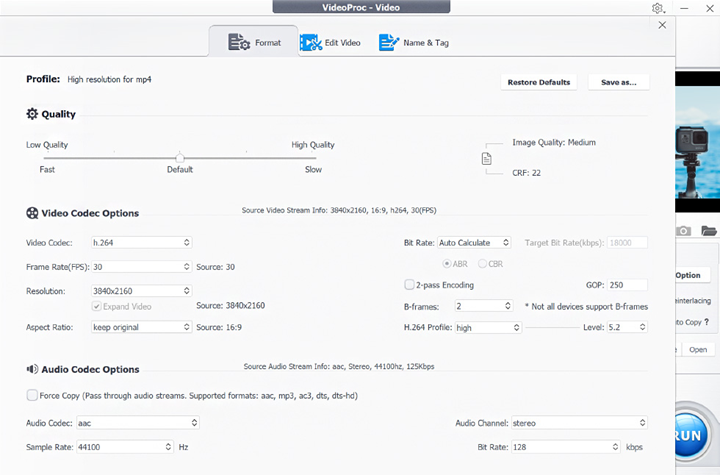 VideoProc is configured as software for those who looking for a simple, stable and fast tool to process and post-produce their own videos made by iPhone cameras, smartphones in general, GoPro, drones or various recorders. Of course, it does not want to compete with professional software of the category of Adobe Premiere Pro CC, Final Cut X and is not for professionals, but better suited to those who do not have an extremely fast computer and intends to exploit some minimal capacity in editing. It guarantees great support for all the most used formats like HEVC, H.264, MKV, AVI, WMV, MOV, WebM, FLV, 3GP and so on, and is specialized for the most difficult videos, such as high resolution, long lasting ones or made with a high frame rate (even up to 240 fps). We prefer VideoProc mainly for its simplicity, and its ability to mix with great compatibility with all popular formats. This Digiarty tool is able to manage files from digital cameras and camcorders, iPhone and Android smartphones, action cameras of all kinds, drones, webcams, security video surveillance systems and even cameras integrated into cars. 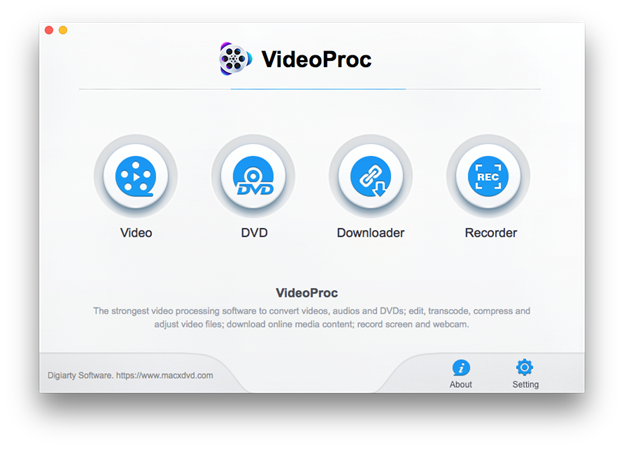 With VideoProc you can edit videos from the devices mentioned above in order to solve various problems: for example, you can convert the videos to a format that can be digested better by the PC or mobile devices for a more efficient and effective reproduction, or compress video disk size. The video processing with VideoProc allows the user to load it on a remote server or a cloud service using a significantly lower time, or simply store it in the local PC space “consuming” a lower part in the device of storage. The user can also edit videos to upload them to social networks or on online sites or video-sharing platforms, modifying not only the final dimensions, but also the duration, the frame rate the resolution according to your needs. For example, you can convert a 4K-to-HD video for playback on a mobile device, and change bitrates and frame rates by reducing the size of the storage space for playback, for example, on a smartphone. Comes with advanced and unique GPU hardware acceleration to speed up the 4K video compressing progress. Easily process and resize GoPro 4K videos, and videos from other action cameras. With VideoProc the user can apply different effects to optimize the quality of the image: it is possible for example to stabilize the shots, remove the noise or the fisheye effect of the ultra-wide-angle lenses typical of GoPro and action cameras in general, or resolve the audio delay, if any. 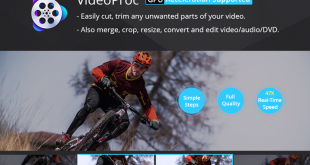 You can easily process and compress GoPro iPhone 4K videos very efficiently. Once you have made the necessary changes and created the montage as we had it in mind, you can make a plethora of changes: for example, we can cut or “crop” the frame, use color filters or add subtitles and overlays, or even images from the webcam on the PC. It is very interesting to take advantage of what Digiarty calls 3-Level Hardware Acceleration. When encoding is done to get the final file with all the changes made, the computer must process pixel by pixel each frame of the recording. It is here that VideoProc offers its advantages, being able to exploit different technologies: among those compatible with the software we cite, for example, Intel Quick Sync Video, NVIDIA CUDA and NVENC, and the technologies integrated into the AMD chips. Through the use of the technologies it is possible to optimize the time of encoding using the hardware that is available in your computer without any compromise in the final quality. With these characteristics VideoProc combines a clear user interface for everyone and extremely simplified, with different presets that can be selected by pressing a few keys. Moreover, among the functions of the software we also have the possibility to convert DVDs, download videos from various online services, or record the screen. The full version can be purchased for $ 29.95, with a one-year license, or $ 42.95 for a lifetime license. 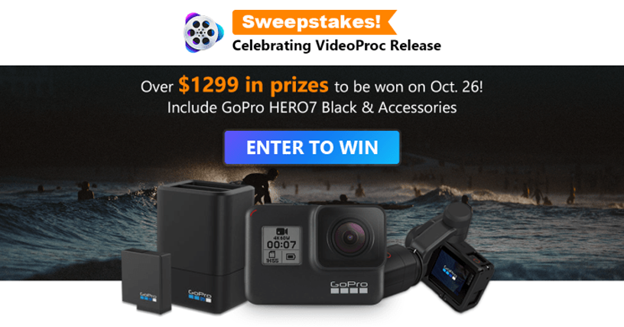 Also worth mentioning is the contest with which Digiarty gives its users a chance to win a GoPro Hero7 with different accessories (including a gimbal worth $ 199) in the download page. The initiative will end on October 26th.